London: US jobless claims on Thursday fell to a 3-1/2-year low and a survey showed New York factories picked up speed this month, bucking gloomy economic trends set by Europe and Asia. And a business survey of New York factories provided more evidence that the US economy is weathering the festering sovereign debt crisis in Europe, which is starting to crimp growth in emerging trade partners like China. While the pace of decline in the euro zone’s business economy unexpectedly slowed in December, surveys earlier on Thursday confirmed the region is almost certainly stuck in recession. That leaves the United States as perhaps the only major Western power currently making a significant contribution to global economic growth. “The data is all very in line with a modestly improving overall economy here in the United States," said Peter Kenny, managing director at Knight Capital in New Jersey. “Stability in the US economy is going to be a vital part of stabilizing global GDP. This comes at a very good time." The New York Federal Reserve’s “Empire State" general business conditions index rose to 9.53 from 0.61 the previous month. Economists polled by Reuters had expected a reading of 3.00. The Philadelphia Federal Reserve’s business activity indicator, another early gauge of private sector activity, is due at 08:30 pm and economists also expect it to rise sharply. In the euro zone, Markit’s flash composite purchasing managers’ index (PMI), which corresponds closely with economic growth, rose unexpectedly in December to 47.9 from 47.0 last month. But it has now lingered below the 50 line that divides growth from contraction for four months. “(It) reinforces the notion that the euro zone economy is slipping into a mild recession rather than falling off a cliff," said Martin van Vliet, senior economist at ING. The survey compilers warned against viewing its latest gauge of euro zone business as a turning point, especially since there is still a strong risk the euro zone sovereign debt crisis could spiral out of control. EU leaders last week took a historic step towards fiscal union last week, but pressure is building on reluctant euro zone paymaster Germany to take immediate, radical steps to solve the crisis. A resolution to the crisis is all the more important as its repurcussions spread through global economy. China saw its first year-on-year drop in foreign direct investment in 28 months in November. The HSBC flash manufacturing purchasing managers’ index, the earliest indicator of China’s industrial activity, rose modestly to 49.0 in December from 47.7 but pointing to a monthly contraction in activity nonetheless. Most economists gave a cautious welcome to the euro zone PMI data, which measures changes in the activities of thousands of businesses across the euro zone. “All in all, despite the further pick-up in December, the PMI data still suggest that euro zone real GDP saw a marked contraction in the fourth quarter," said ING’s van Vliet. The Markit Eurozone Composite PMI, which looks at both the manufacturing and services sectors. Furthermore, only France and Germany were responsible for the upturn in the index, while the euro zone’s peripheral economies continued to struggle. 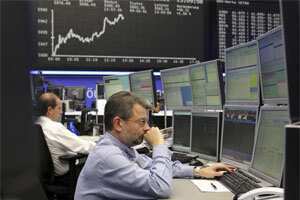 Markit said its data pointed to a quarterly economic decline of 0.6% in the euro zone in the final quarter of this year. That would be twice as deep as the contraction expected by economists in a Reuters poll on Wednesday, which also forecast a 0.2% fall in the first three months of the new year. An escalation of the debt crisis could cause a far steeper contraction next year -- a scenario the Swiss National Bank warned on Thursday could not be ruled out, after holding its exchange rate cap on the franc against the euro for now. There was one bright note on Thursday. The risk premium on benchmark Spanish bonds fell following a well-received bond auction that raised more than the government had targeted.